The advantages of using Local Property Conveyancing Lawyer are numerous. After a long, hard search for the property, you finally have got your sight on the home that has stolen your heart. You know that this is the one and cooked up scenes and scenarios of domestic bliss in its four walls and right now rejection is just out of the way. Buying a property is no easy feat, it is the biggest investment people make in their lives and even more for the residents of Melbourne, considering the rapidly growing property prices. For the buyers, especially the first-timers, it is a daunting task to negotiate and navigate a mortgage deal as many legal matters pertain to the purchase of a property. Many other factors can add additional hidden costs to the whole process when you are unaware of what to look out for in the fine prints of the deal. Different properties come with their own legal regulations that must be adhered to. Therefore it is important to understand the ins and outs of the conveyancing process. 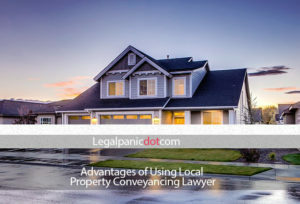 A licensed local property conveyancing Melbourne lawyer would be more aware of the legal nuances in a given suburb than a national practice based conveyancer. Simply put conveyancing is a legal transfer of the title of a property from one owner to another. There are various steps that need to be completed successfully and professionally. Here are the steps involved, initial paperwork and draft contract, introductory enquiries from the seller’s lawyer, organising survey and searches, mortgage offer, approval of the draft contract and exchange of contracts. If you have chosen a lawyer outside your locality, you will often have to converse via email or phone and if you would want to meet them face-to-face, it can involve a long drive and inconvenience. You are instructing a lawyer to handle possibly the biggest investment of your life, so a face-to-face meeting to talk things through so that you both understand the transaction in detail is more beneficial and you can directly ask the questions as well. This is only possible if you hire a local property conveyancing lawyer. Imagine waiting for 30 minutes or perhaps long hours during the day for the conveyancer to reply to your phone call or email to get an answer for your query? A Local conveyancing lawyer means that you can pop in with or without an appointment to get your questions answered or to fill out paperwork. This makes the conveyancing process much more convenient for all involved. A local conveyancer is much closer and more easily accessible. Local conveyancers provide a level of dedication and professional communication that is upheld by the lawyer’s regulatory authority. Not that conveyancing professionals are not dedicated to their jobs and helping out their clients, however, a local conveyancer will offer much more personalised, high-quality customer service. Local property conveyancing lawyers will take the time to understand your needs and answer questions or any concerns you may have. This is the biggest advantage you will get with using local conveyancing services over their bigger business peers. Using an established local conveyancer with the strong history in the region will give you a wealth of local knowledge. They will have much more intimate knowledge of the property you are dealing with than other national conveyancing services. Not only is this beneficial in speeding up the transaction process but also the accuracy with which the work is carried out. P&B Law in Melbourne has been in existence since 1994 offering quality and professional service. As a result, they have a specialised team of conveyancing experts who have a wealth of local knowledge and expertise. More often than not, local property conveyancing Melbourne lawyers will offer more valuable services in comparison to national practice based conveyancing lawyers. These national conveyancing firms need more capital to run will cost more. Thus, smaller, local peers have lower overhead costs and can keep the cost of services lower. Once the transaction is completed, chances are you must be looking for a subsequent legal service. So, having a lawyer with local knowledge that you can meet face-to-face, one you can get to know over time and trust in addition to the factor of reliability can help beyond conveyancing, for instance, making a will or declaration of trust. For many property investors, conveyancing is a whole new topic that is why it crucial to consider a local lawyer in your search for the conveyancing process. The local property conveyancers provide a ton of advantages mentioned above over the national conveyancing providers. An experienced conveyancer with thorough knowledge is worth the money. When looking to hire a conveyancer, seeking advice from friends and family who have undergone the process would be beneficial or you can ask your lender, mortgage broker or independent financial advisor. You can also search online, but before hiring visit their website and social media profiles as it will give you the representation of their values, professionalism and friendliness. You would also need to look into the fees as property lawyers often charge in different ways such as a fixed fee, an hourly rate and a percentage of the property price. Whenever hiring property conveyancers, it is good to get quotes from three different firms to compare and then choose the best fit in your budget and services provided. Thanks for pointing out that a local conveyancer will have a much more intimate knowledge of the property you are dealing with than someone else might. My husband and I are thinking about buying property to build on, and it would be nice to have somebody that knows that area really well. I think that having someone who knows what they are doing look at the property for you would give you more peace of mind about investing in it.